On top of spagheeeettttiiii.....all covered with cheese. I lost my poor meeeaaaatttballll when somebody sneezed"
Yes, I know the rest of the words/verses but I will spare you. The song has been in my head all day. I have a long, loving history with meatballs. My dad is half Italian. My grandmother, who was 100% Italian, was not a good cook. Somehow it seems scientifically impossible for an Italian to NOT be a good cook, but I am told she broke the mold folks. And the question remains. What do YOU call it? Gravy? Red sauce? Marinara? Spaghetti Sauce? Whatever you call it in your neck of the woods or in your house, it is DELICIOUS! As a kid we always looked forward to spaghetti and meatball nights. It would take my mom hours to prepare. I have learned it didn't really take that long but it just took HER that long. She likely weighed every meatball to make sure it was the same. Get where I am going? She made her meatballs the size of a baseball, they were huge. We always got to have whatever we wanted for dinner for our birthdays and the request was usually always the same, spaghetti and meatballs. Well when I moved to Jersey and got in closer contact with my Italian heritage, and have an Italian mother in law and aunts, I have tweaked and twisted my own recipe to what my family deems perfect. 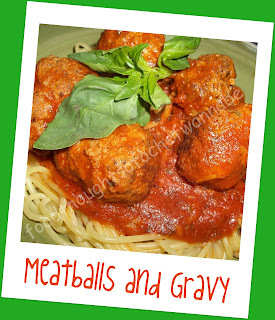 We like a softer consistency to our meatballs, and now I can't find ground veal so I use beef and pork. Your meatloaf mix can have any combination of meat you like. Traditional meatloaf or meatball mix is 1 lb each of ground beef, ground pork and ground veal. I use 2 lbs of ground beef and 1 lb ground pork. You choose what you want, just try to use at least 2 different kinds and include pork in that mix. You need the fat from the pork for a juicy, tender meatball. My measurements might make you wonder if it can work, but I assure you it does and they are fantastic!! So let's get started with the meatballs and then move on to the gravy! Mix all ingredients. Some people say mix the meat in last, I don't find it makes a bit of difference. Get your hands in here, and make it work!! Form meatballs. I make mine about golf ball size and I got about 56 out of this batch! Now is where the decisions come in. Bake or fry? I normally bake, but I promised my husband I would brown them tonight in a skillet. If you bake, I do it on 400 degree's for 10-15 minutes. Remember you aren't wanting them to cook all the way through, just brown on the outsides! They will cook the rest of the way in the sauce. If you fry do in batches, using olive oil in your skillet. Brown them and then turn over and brown the top. No need to flip them in 10 directions for 10 minutes. Top and bottom is all you need browned! When you are done submerge them in the pot of gravy and simmer on low for 2-3 hours. Stirring occasionally. I think I did this backwards. I should have given you the gravy recipe first! Here is what you will need for that! Mince your onions and garlic. I grate my garlic actually. In a large pot add 2 tbsp of olive oil and add in your onions. Sweat them out for 2-3 minutes and then add the garlic. IMPORTANT, if you burn your garlic you will need to start your dish over completely. Burned garlic is bitter and terrible and will ruin your entire dish!! Stir for a minute so garlic doesn't burn and then add tomatoes, and tomato soup. Rinse your tomato cans with a little bit of water and add that in as well. Season as you go, with each addition of ingredients salt and pepper, when you are done your gravy will be well seasoned and almost perfectly salt and peppered. Just before serving tear in your basil and stir. If you cook basil to long, it will turn black on you. Yuck! I hope that you give this recipe a shot. Make sure to salt your food enough but not over salt. Use plenty of fresh basil and GOOD parm!